11th Bn, The King's Royal Rifle Corps, 59th Brigade, 20th Division, B.E.F. Wilfred Hancock was born in Harbledown, Kent, the son of Sardius and Mary Jane Hancock of The Pastures, Tan House Lane, Malvern. His father was a well-known temperance advocate in Malvern Link. He enlisted in the King’s Royal Rifle Corps at Coventry from the Ordinance Factory in November 1915 and went to France in June 1916. He did not have to enlist as Ordinance Work was a reserved occupation. In October 1916, his parents heard from the War Office that his Wilfred was reported missing after an engagement on the 3rd September. 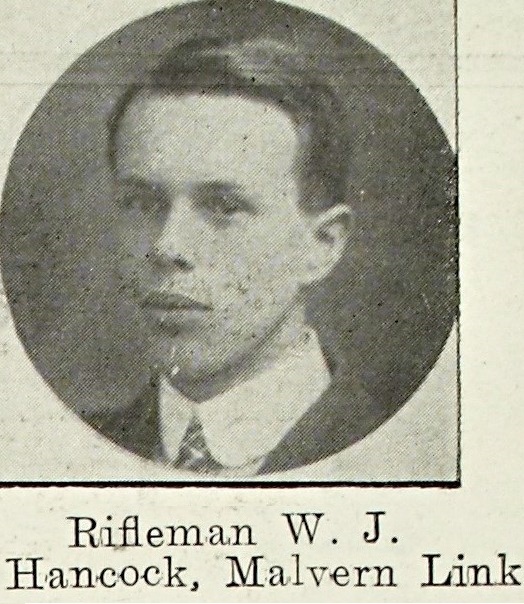 At the time his brother Lieut R Hancock, Worcestershire Regiment was at home recovering from wounds.